Ardens Rose of Sharon Tree, is the tree form of the Ardens bush producing gorgeous double petaled light purple blooms in summer. These trees are shipped bare root in a dormant to semi-dormant state as a 2 to 3 foot specimen, easy to transplant and ready to grow. Your Hibiscus trees are 2 year old trees and will produce masses of 3 to 5 inch double, rose-purple flowers blooms all summer long. Peak bloom takes place in July to August. Plant Ardens Rose of Sharon Trees as an entrance to a garden or along walkways or drives. Or, place in a large container as a patio potted plant. The purple blooms of the Hibiscus Syriacus 'Ardens' are certain to attract butterflies and hummingbirds to your garden. 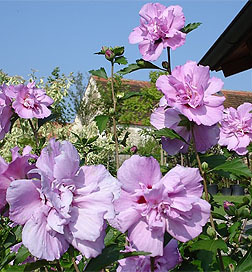 Rose-of-Sharon Hibiscus is valued for large flowers produced in mid-to late summer when few other shrubs bloom. The plant grows in sun or partial shade and in any soil. The growth rate ranges from slow to moderate, and transplanting is easy. The single or double flowers are in shades of red, pink, white and purple, depending on the cultivar. Peak bloom takes place in August. Prune your rose of sharon in late winter or early spring. Frequent severe pruning gives fewer but larger flowers; no or little pruning gives many small flowers. Young plants are not as hardy as older plants. Greenwood Nursery offers a wide selection of Rose of Sharon trees and shrubs. Ardens Hibiscus Tree Form Plants ship one 2 to 3 foot bare root transplant.